Flat Broke by Gary Paulsen. A Companion to Liar, Liar. Review: Kevin, like all boys likes one special girl. With him telling lies all of the time, he now finds himself with no allowance for a month and completely out of money. 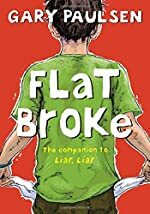 In this stand-alone book, Flat Broke by Gary Paulsen, Kevin tries to come up with new ways of making some money. From baking brownies and cookies, to cleaning out garages, Kevin tries everything to make money. Before he knows it, he's got so many activities to handle that he can't keep track of them all. Kevin then learns that money isn't the key to everything. Trying to impress the girl of his dreams is one thing, and losing his allowance for a month is another. When Kevin tries to start his own little businesses, he's busy all twelve hours of the day. He's renting out places, and helping other kids make some money so they can give him some of the profit. Kevin is making good money and everything is looking good until his workers leave and other people offer better deals than him. Kevin then learns the value of money, but is it too late? I rate this book a seven out of ten. I prefer action and fantasy novels so Flat Broke really was not my type of book. However, I'm confident that others will love this book though. It is a story worth reading. One example that I liked most about this book is that it will teach you a lesson about the value of money. Like Kevin, readers will realize that money isn't everything, and that there are other more important things in life. Gary Paulsen has written many other good books, and for people who enjoy a good realistic fiction novel with a solid moral, this one is certainly one of the best. Review written by William (6th grade student). We would like to thank Random House for providing a copy of Flat Broke for this review. Have you read Flat Broke? How would you rate it?